For over 25 years Joan Sotkin has helped entrepreneurs and practitioners experience freedom from struggle personally, professionally, and financially. Thousands have benefitted from her groundbreaking book Build Your Money Muscles: Nine Simple Exercises for Improving Your Relationship with Money and her ongoing support programs. Joan is a holistic Prosperity and Mindset Mentor and a dynamic, inspiring speaker who brings a depth of knowledge plus a huge dose of empathy and compassion to her work. She is THE expert when it comes to understanding how emotions learned in early childhood can affect a person’s earning capacity as an adult. Founder of Prosperity Place, Joan Sotkin suffered from a long list of physical, emotional, and financial problems for many years. 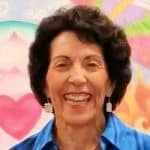 After giving away all of her possessions, an extended spiritual journey connected her to the deeper parts of herself that led her to everything she needed to find health, well-being, and peace of mind. Like most of her clients, Joan’s financial problems were the most difficult to overcome. In the 1980s, she thought she was on the way to financial security as she rapidly built a wholesale, retail, and mail order business to the point where she was grossing over $30,000 a month. Her lack of business and financial skills led to her downfall—and bankruptcy. This experience led her on the path of learning everything she could about business and financial management. The knowledge she gained allowed her to flourish as an entrepreneur while sharing what she learned with others.